In most cases purchasing a sofa for our living rooms eats up a big chunk of our budget. Due to this we normally stick to neutral sofa's so that we can switch things up as the years go by. I did this in my own home and it's something that I always recommend to clients. Could you do it? Or do you think buyers remorse would set in after a couple of weeks? I think these are lots of fun. My last sofa was a patterned sofa. I bought it to hide stains which was a great idea because it worked. Sadly...after 5 years I was tired of it. Now it sports a white slipcover. It makes changing things up much easier. I would love to do it, but I'm chicken! I love prints anywhere, but I'm also into changing things up when the mood strikes. 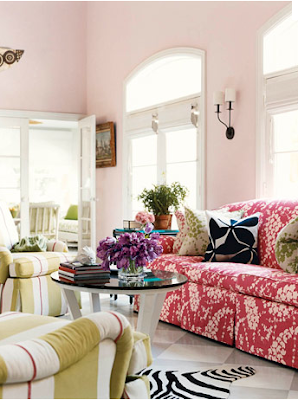 So I usually limit bold prints to a pillow, side chair, ottoman, or curtains that can easily be switched out and don't require a major commitment! Ah...these pictures all made my heart skip a beat- love love love! 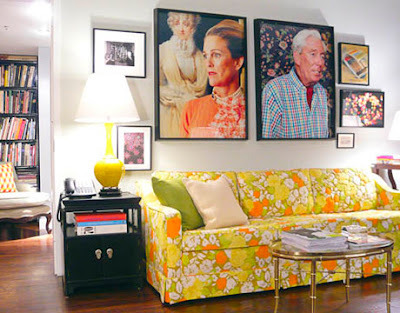 I adore the picture with the large photographs above the floral sofa- Also loving the Lee Jofa fabric on the 3rd picture- such a great print. And of course, the La Fiorentina loveseat is divine (I actually just scored 4yards of it on ebay for $80 so am pretty excited about making somethin with it.) I chose a charcoal solid sofa and layered pattern with cushions (I actually just posted pics of the room today) but I would love a patterned piece like the ones you posted- I adore great pattern and fabric so would definitely be into a sofa in a great print. 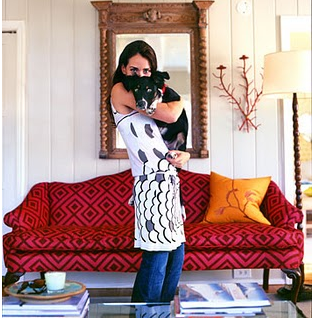 I had a crazy red patterned sofa that I bought right after graduating. It was a splurge -- beautiful and excellent quality. I loved it for years! But after looking at it for a solid month (home-bound when my twins were born), I was SO OVER IT. Actually, I'd be over it for a while -- but now I was stuck looking at it all day and all night. My husband came home and asked where it was. I informed him that I sent it to be reupholstered. He didn't dare say a thing! Those prints are awesome! I wish, wish, wish I could do it -- make the jump to a patterned sofa. But I'm so fickle with patterns that it makes me way too nervous. Maybe someday I'll be able to commit :). that elle decor cover is my absolute fav. its in my decor files. im trying it baby steps. i have chevron valances and these liberty of london shades, my parents think it looks like throw up but i kinda like it lol. These spaces are so playful! so fun! but i would be too chicken for sure! I really want a patterned sofa. Mine is off-white now and it's just so blah and uninspiring. I generally don't get sick of patterns so I'm not too worried about buyers remorse. I went to Mitchell Gold and was poring over their fabric selection when the salesman came over and said "we really recommend solids for sofas" - when there wasn't a single solid in front of me. It was a turn-off and I left soon after. Plus I wasn't in love with any of their patterns. 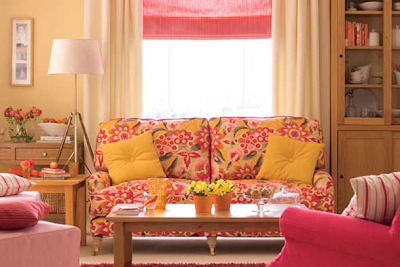 Like you I usually prefer and also recommend a neutral sofa and bring pattern into the room in pillows, a chair etc. 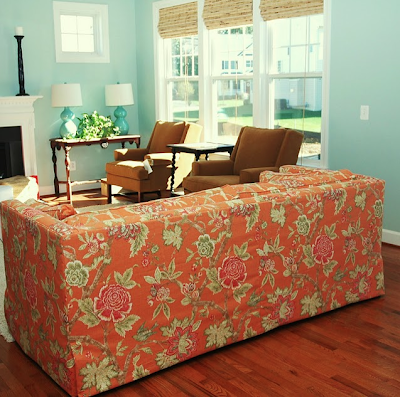 but if you notice, many of these photos show slipcovers which is a great way to live with color during a specific season i.e. plaid for winter, floral for summer and not grow tired of it. Nice post. 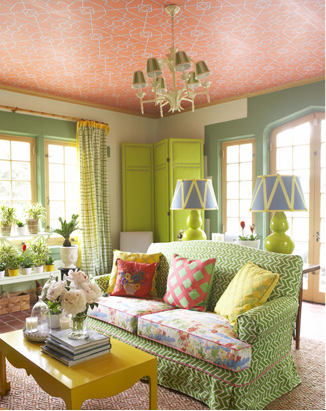 Love the colors and patterns but I would probably get tired of it. I say - slipcovers to change at will (LOL)! Wouldn't that be wonderful! Love the orange, yellow, and green. My Grandmother had a sofa just like that and I loved it!!! Too bad my aunt sold it in a garage sale, I would have loved to have it in my home. I LOVE, LOVE, LOVE, LOVE, LOVe the first image! and yes I really do LOVE them that much! 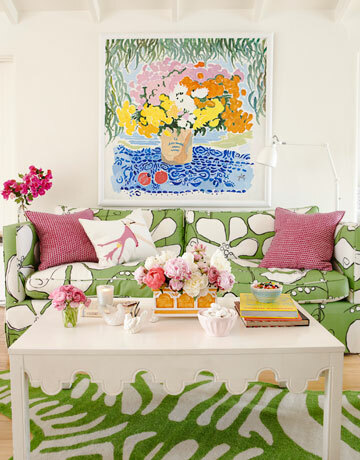 I would love to have a patterned sofa like this one day! It definitely makes the room!